These performance measurements are centered around default formatting of a single int integer number using different libraries and methods. The overall execution times for those examples are compared below. 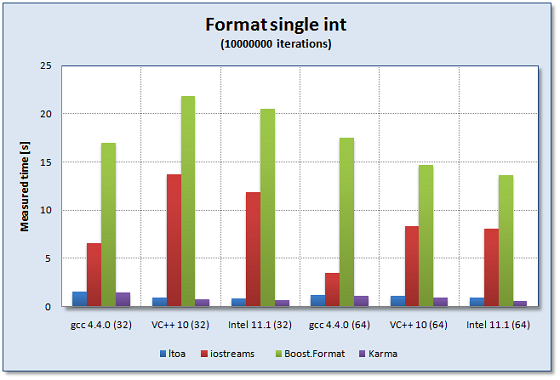 We compare using sprintf, C++ iostreams, Boost.Format, and Spirit.Karma. For the full source code of the performance test please see here: int_generator.cpp. All the measurements have been done by executing 1e7 iterations for each formatting type (NUMITERATIONS is set to 1e7 in the code shown below). The following table shows the overall performance results collected while using different compilers. All times are in seconds measured for 1e7 iterations (platform: Windows7, Intel Core Duo(tm) Processor, 2.8GHz, 4GByte RAM). For a more readable comparison of the results see this figure.